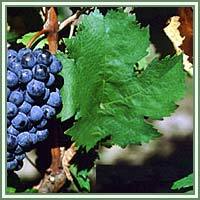 Habitat: Grape Vine is native to the Mediterranean region, central Europe and southwest Asia. Description: Grape Vine is a liana with twining bark, growing to 35 m tall. The leaves are alternate, palmately lobed, often resembling maple leaf. They are broad and large, green in color. Near the leaves small tendrils appear, giving support to the shoots growth. Flowers are arranged in clusters, growing opposite leaves along the shoots. The fruits are berries, 6 mm diameter in wild species, and up to 3 cm long in cultivated plants. Berries, usually called grapes, can be black, red or green-yellow. Useful components: Sugar, gum, malic acid, dextrose, potassium acid tartrate, tannin, fixed oil. 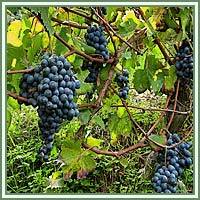 Medicinal use: Grape Vine has astringent, anti-inflammatory, detoxifying and antisclerotic properties. Seeds and leaves are astringent. Leaves have been used in traditional medicine to stop hemorrhages and minor bleedings. Ripe fruit can influence the kidneys, promoting urine flow. Along with a nourishing diet, grapes can greatly help people suffering from anemia and exhaustion. Grapes are also useful in cases of small-pox, neuralgia and insomnia. Safety: Some herbs could interact with certain medication. Therefore, it is advisable to consult your doctor/herbalist before consumption of any herb.